One of these militiamen made headlines recently when he got into an armed confrontation with a Maricopa County sheriff's deputy. This was especially noteworthy, since Sheriff Joe Arpaio – a well-known nativist figure himself – made a point of denouncing the vigilantism of the border watchers. Last week, KPHO in Phoenix aired video of one militia in action in the desert and at a recruitment gathering. The militiamen, who insisted on anonymity and used such monikers as "Reaper" and "Raptor," said they were only performing a public service. "We're here to protect our community, first and foremost,” the man dubbed Reaper told the reporters. “Protect our state, second. And in doing so, that also means curbing the flow of drugs into our cities. 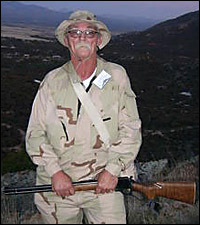 This militia, called the Mountain Minutemen, is being operated by a former California Minuteman named Robert Crooks, who has since moved to Arizona. As did Simcox and his colleagues, Crooks insisted to the KPHO reporters that he "wants to change the way militias are viewed" and claimed he doesn't accept felons or racists. He also dismissed the confrontation between a militiaman from his crew and the Maricopa County sheriff's deputy. "In reality, it was just the fog of war," said Crooks, adding that he is trying to cut down on drug smuggling through the Vekol Valley. "I've been shot at 23 times in 24 months," he said. The man dubbed "Reaper" also described for the reporters how the group allows for military contractors – a number of whom showed up for a recruitment meeting, including some on active duty – to participate without officially joining so they can get around government prohibitions against joining militias. "So we have runarounds that will legally allow for membership without the membership," said Reaper. "So you'll pass your polygraph, and everyone can sleep at night." Crooks, who goes by "Little Dog," has a colorful history as a border vigilante. He got his start running border watches in the Campo, Calif., area for movement co-founder Jim Gilchrist and his Minuteman Project. In 2007, he e-mailed to several nativist leaders a video that appeared to show someone shooting at two or three men attempting to cross the border. “This video shows how to keep a ‘Home Depot’ parking lot empty,” Crooks wrote. When asked by reporters, Crooks denied being the shooter in the video. A week later, a second, more disturbing video surfaced, purporting to show the actual shooting of a border crosser with a backpack. Crooks later admitted that the shooting was faked. "The issues with militias out in the desert itself are significant," Molina said. "Most recently there have been a series of deaths that have occurred in the Gila Bend area. And although humanitarian groups and law enforcement are very concerned about that area and can see that there has been an increase in deaths, unfortunately, there has been such a severe problem with the militia that humanitarian groups and law enforcement have had concerns about patrolling and even entering certain areas of the desert." Molina said that she and her workers encounter "everyday attitudes" among militia groups that are uniformly hostile and violent. "It's not uncommon for us to receive threats or to have our offices, our trucks, our water stations vandalized, stabbed, shot," she said. "We live with this violence every day." The movement’s free fall has been caused by several factors, including the co-optation of the immigration issue by a number of state legislatures and a spate of criminal scandals involving movement leaders. Those include the murders of an Arivaca, Ariz., man and his 9-year-old daughter by movement leader Shawna Forde and two others in 2009; the lethal rampage of border-watch organizer and neo-Nazi J.T. Ready in 2012; and Chris Simcox's recent arrest on charges of child molestation and the revelation of earlier accusations against him.